A Cancer victim can never receive too much encouragement. 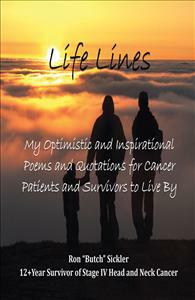 Life Lines is based on the author’s Cancer experiences and aims to help inspire other Cancer sufferers during their courageous journeys. In 2004, the Author was diagnosed with Stage IV Head and Neck Cancer. After his diagnosis, Butch researched his form of Cancer and learned about the disease and the best treatments for eliminating it from his body. After more than three years of Cancer Therapy, Recovery, and Aftercare – in December 2007 – Butch was declared by his doctor to be “Cancer-Free.” With Life Lines, Butch has combined his uplifting Cancer-related poetry and quotations with full-color photographs in the hope that his own Cancer experiences during his ordeal will help to encourage and comfort other Cancer victims during their brave, challenging journeys.